Today’s Guest star post is for Quirky who was adopted by Frank and Vicky Giannangelo on San Juan Island, WA,in Aug. 2013, and in January 2014 they all moved back to New Mexico. Quirky lives a pretty normal life….! He plays, eats, and uses the litter box just like the other kitties. We have declared that he was born on July 23rd, 2013….he was found in the woods with his sisters near the San Juan Island dump and brought to the local shelter. He was almost put to sleep because he was blind, either from birth or some trauma, and had head shakes. He has outgrown most of the head shaking, but when he in intent on something, we notice a little quivering. He is a very happy kitty and really navigates well… he will run his ears along a wall until he knows where the doors are. Sometimes he runs into the wall at a full run when he is playing with another kitty, or running around too fast. He still does not know he is supposed to lick his furs or his hind end…but we give him little wipes now and then. Charlie (two months older) gives him baths and is his best friend. (2 months older). He has 4 other kitty fur mates: TrotTrot, who is 5, Market, Fluff Fluff, and McPuppy – all who are 14-15. He has 2 dogie mates that are about 15. He is the baby. He is a pure, trusting bundle of joy. Watch him grow up: all his videos are here from 5 weeks to now. To meet Quirky and find out more of his amazing stories please visit him on Facebook by clicking here. And for his parents Gardening blog please click here. 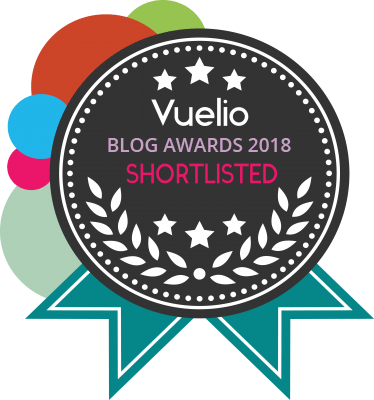 We hope you are looking forward to many more fun stories here @Katzenworld and don’t forget you can also follow us on Bloglovin now by clicking here. This entry was posted in Guest Cats and tagged blind cat, cat, cats, cute, guest cat, katze, katzen, kawaii, Quirky. It made me very happy to read this. Hooray for Quirky being adopted by such a loving family, and having buddies to play with 🙂 To think he was nearly put to sleep! had so much fun watching the vids.. thank you for sharing.. Quirky is a wonderful and adorable kitty. Always pleased to read these happy ending rescue stories! our own Abby Abyssinian cat is blind in her right eye. The woman we got her from had rescued her from a cat show. The kitten was in a cage alone, her eye very infected with feline herpes. The cattery owners were going to euthanize her, but her rescuer offered to take her. We have had her since she was 3 years old, and she is now 12, and still going strong. The eye has not slowed her down one bit! Thank you :). And I really don’t understand people that won’t to put down pets with small disabilities. 🙁 as you may have seen one of my adopted cats is three pawed AND black. The charity was really worried that they wouldn’t be able to find someone to take her in. We saw her. Fell in love and took her in right away :). And she beats up her 4 legged brother in play fights all the time haha. I love that adorable sweet kitty and everyone who’s helped him. So cute. What a wonderful little kitty – he looks as though he has a wonderful personality. Thank you for loving him and caring for him so well and giving him a normal kitten life. Aww, such an adorable little kitty. She’s spunky, that for sure. Thanks for sharing the video. It was fun to watch. Quirky is a clever and lucky little guy! I just want to scoop him up! Really … I LOVE IT ! Cute glasses! Very very cute ? What a darling he is. Mmmm kitty cuddles ? ?